Jordan (Briana Henry) told Franco (Roger Hogwath) he would plead guilty to the murders. Franco refused to say he committed three brutal murders. At The Floating Rib, Chase (Josh Swickward) noticed Willow staring at Brad (Parry Shen) and Lucas (Ryan Carnes) and questioned whether there was something about the couple that bothered her. Also at The Floating Rib, Alexis (Nancy Grahan) watched Kim (Tamara Braun) and Julian (William deVry) celebrating Valentine’s Day. Ryan (Jon Lindstrom) arrived at Ferncliff and confronted Kevin (also Lindstrom) about lying about the prenuptial agreement; now he had to deal with both he (Kevin) and Laura (Genie Francis). Meanwhile, Laura was stopped by security for being at Ferncliff after hours. She explained she had board approval and could drop in for an unannounced visit. Kevin assured Ryan the prenup existed and was hidden in the safe located behind his accreditations. Lulu (Emme Rylan) was shocked when Nina (Michelle Stafford) and Charlotte (Scarlett Fernandez) shouted surprise when she entered the house with Spencer (Nicholas Bechtel) and Curtis (Donnell Turner). But that was nothing compared to Lulu’s shock to learn Nina was remarrying Valentin (James Patrick Stuart). Nina insisted she knew what she was doing by marrying Valentin, and Lulu was wrong about Franco. Jordan told Franco that in order for her plan to work to lure the real killer to come forward out of jealousy over the attention he’d get confessing to the murders, Franco couldn’t tell anyone the truth not even Elizabeth (Rebecca Herbst). Jordan reminded that if he plead not guilty, he’d be convicted. Michael (Chad Duell) had a date with Zoe, a woman he met through a dating app. But not only had Zoe lied on her profile, but she was more interested in her cell phone than Michael. She told Michael he was date number three on her date schedule that evening and was her favorite so far. On to date number four, which turned out to be Dr. Neil Burns, who was also at The Floating Rib talking with Alexis. But since he looked older than his photo, Zoe passed. Laura finally saw Kevin and called out to him. Kevin heard his wife. But Ryan jabbed her with a syringe and she passed out. Carly (Laura Wright) and Sonny (Maurice Benard) waited for her doctor’s arrival. Carly commented on how cold it was in the room and that there was no clock. Kim (Tamara Braun) entered announcing she was asked to cover the appointment. Drew (Billy Miller) met with Jason (Steve Burton) on Pier 55. Cain was eager to know the truth about Hank Archer or Shiloh (Coby Ryan McLaughlin). Drew told Jason how relieved Shiloh seemed when he (Drew) let Shiloh know he didn’t want to have the memory restoring procedure. Meanwhile, Shiloh told Sam (Kelly Monaco) he didn’t know who she was before but liked the woman who was in front of him now. He wanted to show her something and wanted her to go away with him. Maxie (Kirsten Storms) ran into Peter (Wes Ramsey) outside Kelly’s and told him she was ready for her caper on Sasha (Sofia Mattsson). To that end, Ms. Jones met Ms. Gilmore at the nail salon and suggested Sasha have her nails trimmed before polishing them. D.A. Margaux Dawson (Elizabeth Hendrickson) came to see Lulu (Emme Rylan) to see whether Ms. Falconieri was ready for Franco’s (Roger Hogwarth) arraignment. Lulu said that wanted to look her attacker in the eye and ensure he got what he deserved. After the D.A. left, Lulu told Curtis she didn’t remember how she escaped but once Franco was put away she intended to ask Kevin (Jon Lindstrom) to put her under again. Kim confirmed that Carly was pregnant and was right in her targeted date of conception as New Year’s Eve, making her six weeks along. Maxie commented to Sasha how Nina had a big heart and the people who loved her like them needed to protect her from being hurt. Peter came with flowers to visit Lulu to see how she was feeling. He brought her a new laptop with her files cloned as the police kept her old one as evidence. Lulu wanted to write a first person account of the attack, but Peter worried how reliving the attack would affect her health. Kim told Carly and Sonny that although a stroke was a possibility due to Carly’s age and past pregnancy history, if she monitored her diet, got plenty of rest and avoided stress, she’d be fine. Marcus ran into Stella (Vernee Watson) at Kelly’s and told her how he had small boxes of chocolate delivered to the home for Yvonne (Janet Huber) for Valentine’s Day. Kristina (Lexi Ainsworth) asked Michael (Chad Duell) for a loan for a business venture and promised to pay it back with interest. Michael agreed to the loan. Curtis told Sasha he hoped she was as sincere as she appeared. Kim commented to Drew how she wondered what it would have been like had they raised Oscar (Garren Stitt) together. Sam met with Jason on Pier 55 and told him Shiloh wanted her to go away with her. Jason didn’t think that was a good idea. Carly was excited about having the baby. Maxie (Kirsten Storms) commented to Peter (Wes Ramsey) how a part of her really doesn’t want to know if Sasha (Sofia Mattsson) is not Nina’s (Michelle Stafford) daughter. At Kelly’s Diner, Oscar (Garren Stitt) was disappointed when he received a text stating that due to his medical condition he wouldn’t be issued a junior driver’s license. Cameron (Will Lipton) was furious when Elizabeth (Rebecca Herbst) told him she married Franco last night at the police station. The teen accused his mother of being out of her mind, reminding she could have supported Franco without marrying him. Cameron hoped Franco was denied bail otherwise an accused murderer would be living with his (Cameron) little brothers Jake (Hudson West) and Aiden (Jason David). Maxie told Peter she hoped she’ll be wrong about Valentin (James Patrick Stuart) deceiving Nina with a fake daughter. At Kelly’s, Nina asked Alexis (Nancy Grahan) to draft a new will for her (Nina) where she can include her entire family (daughter Sasha and husband-to-be Valentin) before she remarries Valentin. When Nina left the table to speak with Alexis, Valentin told Sasha he knew she’d tried to talk Nina out of remarrying him but assured Ms. Gilmore didn’t need to protect Nina from him. Oscar, Josslyn and friend Trina arrived at the Webber home and discuss with Cameron a trip to Niagara Falls. Ava (Maura West) waited with Julian (William deVry) for “Kevin” (Jon Lindstrom) to take her to Franco’s (Roger Hogwarth) arraignment. Meanwhile, Laura (Genie Francis) woke up in the basement of Ferncliff and went to Kevin. Ryan taunted the couple about how he got away with three murders and the attack on Laura’s daughter. He gave Laura her cell phone and a script he wrote and threatened to kill her if she didn’t call Lulu (Emme Rylan) and tell her daughter she could’t make the arraignment. But Ryan’s gloating ended when Kevin reminds him that his mistake in committing the murders is what will trip him up and Laura said Kevin has a bigger brain than his twin. Ryan left for the courthouse. Kevin and Laura caught up and she told him what’s happened to her since her return from France. Laura learned Kevin had been trapped at Ferncliff since the last week in August and how she and Carly (Laura Wright) almost found him. Since it will take up to ten days for the DNA test as it isn’t an emergency, Maxie found a lab in Poughkeepsie that would do it in twenty-four hours. Peter offered to drive her. 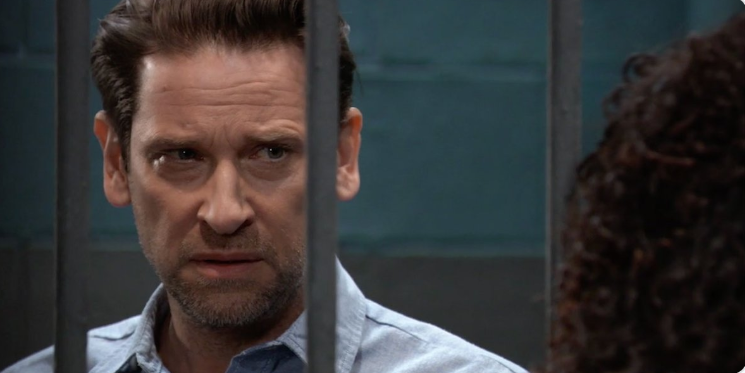 Franco pleaded guilty to the shock of Ava, Lulu and especially Ryan. Both Ava and Lulu felt that something was off with Franco’s plea. The judge remanded him to Ferncliff for two weeks evaluation before sentencing. Elizabeth asked her husband why and when he answered it was the right thing to do, a hurt and betrayed Liz took off her wedding rings and threw them on the floor. Pained, Franco picked them up. Carly (Laura Wright) left a voicemail message for Olivia and asked her to take over some of Carly’s responsibilities at The Metro Court. Sonny (Maurice Benard) asked his wife how much she was handing over to Olivia. Carly assured she was working on cutting down her stress as well as monitoring her diet; she’s now eating organic potato chips. Josslyn (Eden McCoy) was surprised to see Carly home and asked her mother whether she was sick. Carly assured Joss she was fine and just went for a checkup. After Sonny left, Josslyn told her mother about the planned Niagara Falls trip. Franco (Roger Hogwarth) sat shell shocked in the courtroom. Ava asked him how he could confess to killing Kiki (Hayley Erin). After Ava walked away, Jordan (Briana Henry) asked Franco how he was doing. Franco said he just lost the one person in the world who believed in him…his Elizabeth (Rebecca Herbst). Returning home, Elizabeth started to smash the framed photo of she and Franco when Drew (Billy Miller) arrived and comforted her. But Cameron (Will Lipton) wasn’t so understanding, especially as Liz still insisted on her husband’s innocent and said she didn’t know why he’d confessed to the crimes. Cameron said she’d lost her mind and if Drew wouldn’t protect Cam’s little brothers, Cameron would. Jason (Steve Burton) told Sam (Kelly Monaco) he intended to follow she and Shiloh (Coby Ryan McLaughlin). Shiloh was annoyed when Harmony arrived in Port Charles. She said she came to give him a warning that Jason Morgan was about to close in on him and she wasn’t about to let him bring down the rest of the group. Jason told Sam of a similar incident in which one of his followers stepped up and took the blame for him (Shiloh). He asked her to make sure the GPS on her phone was was on when she met with Shiloh. Meanwhile, Shiloh told Harmony he’d planned to take Sam McCall to a place he referred to as ‘The Tower.’ Drew told Elizabeth to go with her gut and if she believed Franco was innocent they’d prove it. Meanwhile, Franco was taken to Ferncliff. He asked Jordan to arrange protection for Elizabeth and her boys. But Jordan assured they won’t be a target of the real killer who will be more interested in upstaging Franco. Dr. Cabot regained his sight and told Anna more about the virus and her twin Alex’s involvement. Robert (Tristan Rogers) told Lulu and Sonny some information about Dante. After Lulu left, Agent Scorpio revealed Dante was now flying blind as a civilian without the WSB’s help for fear of a national incident. Shiloh called Sam and arranged to meet her later that night. Ryan proposed to Ava. She was reluctant as he was technically still married to Laura. Ryan assured that Laura agreed to end the marriage soon and the people stopping them from being together where them; and he had no intention of stopping it. So, Ava accepted the marriage proposal. 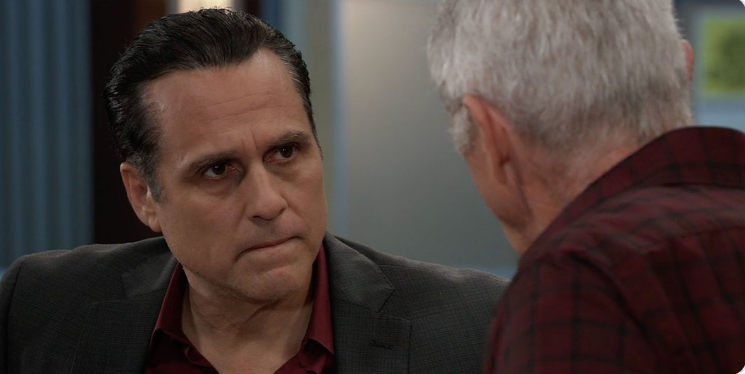 Sonny (Maurice Benard) questioned whether Robert (Tristan Rogers) intended to leave Dante trapped in the cold. Sonny demanded Robert tell him that he (Robert) had the authority to find Dante and bring him home. But Agent Scorpio said he couldn’t bring Dante home without starting a diplomatic incident. Jason (Steve Burton) told Sam (Kelly Monaco) they had to make sure Shiloh (Coby Ryan McLaughlin) wasn’t playing her. Terry (Cassandra James) knocked on Elizabeth’s (Rebecca Herbst) car window and asked her friend how she was doing. Liz told Terry about Franco pleading guilty but she knew it wasn’t true and needed to find out. Elizabeth told Terry that she and Franco had married. Franco (Roger Hogwarth) refused to Jordan’s (Briana Henry) plan to give a tell-all interview about the murders to an eager reporter. Franco didn’t want to tell the world he was guilty without first alerting Elizabeth to the truth. Jordan gave Franco a burner phone. However, she had it blocked where he couldn’t call any other number but hers. Dr. Cabot told Anna (Finola Hughes) how she’d be abducted and had no memory of participating in the study and contracting the HN242 virus. Ava (Maura West) and Ryan (Jon Lindstrom) came to The Metro Court and announced their engagement to Carly (Laura Wright), who sarcastically asked how his wife Laura felt about it. He said he and Laura would soon be divorcing then told Ava he had to run an errand. Meanwhile, Laura (Genie Francis) pounded on the door yelling for help. Kevin urged her to take a rest. Despite their predicament, Laura was happy they were together. She commented about Ryan surprising Kevin and getting the jump on him (unaware Kevin knew Ryan was alive all along). Ryan entered and threaten to kill them if Laura didn’t sign the divorce papers. At first she refused as Laura didn’t want to make it easy for Ryan to hurt Ava anymore but seeing no choice, Laura ended up signing the document. Ryan left. Kevin assured his wife that if they got out of there, he’d marry her all over again. Carly told Sonny about Ava and “Kevin’s” engagement and Sonny told her that he was going to Turkey to find Dante and bring his son home. Terry urged Elizabeth to yell out her hurt and pain and assured her friend if she ever needed someone to talk with she’d (Terry) be there for her. Franco used the burner phone to make a call. As part of the plan, he arranged to set up an interview. Anna was shocked when she learned that she’d received Alex’s memories. As he drove, Drew experienced a painful headache and and blurred vision and ended up running his car into Jordan. Meanwhile as Jason climbed the staircase at ‘The Tower’ to get to Sam and Shiloh, he too got a bead headache and blurred vision. Then, Jason fell down the stairs! Hearing the noise, Sam rushed down the stairs and found Jason at the bottom.